Vaccine development is one of the greatest achievements of modern medicine. Vaccines made of live-attenuated pathogens can revert to virulent live strains, which causes safety concerns. On the other hand, the use of purified antigenic components as subunit vaccines is safer, but less effective, as these components induce lower levels of protective immunity. Multiple copy presentation of an antigenic determinant in a well-ordered and well-defined orientation on a nanosized particle can mimic the natural host-pathogen surface interaction to provide antigen stability and immunogenicity similar to that of conventional vaccines with improved safety. The icosahedral symmetry of plant viral capsid based nanoparticles is highly ordered and their multivalent structured protein nanostructures facilitate genetic modifications that result in the display of heterologous epitopes or antigens attached to coat proteins. These recombinant plant virus-based nanoparticles (PVNs) provide platforms for the induction of humoral and cellular immune responses to genetically fused antigens from pathogenic viruses, bacteria, tumors, and toxins in man and animals. Here, we comprehensively review the developments of several recombinant PVNs as prophylactic and/or therapeutic vaccines for the prevention or treatment of several microbial diseases, pathologies, and toxin poisoning. Keywords: Plant viruses, nanoparticle, icosahedral, vaccine, genetic engineering, immune response, antigens. Keywords:Plant viruses, nanoparticle, icosahedral, vaccine, genetic engineering, immune response, antigens. Abstract:Vaccine development is one of the greatest achievements of modern medicine. Vaccines made of live-attenuated pathogens can revert to virulent live strains, which causes safety concerns. On the other hand, the use of purified antigenic components as subunit vaccines is safer, but less effective, as these components induce lower levels of protective immunity. Multiple copy presentation of an antigenic determinant in a well-ordered and well-defined orientation on a nanosized particle can mimic the natural host-pathogen surface interaction to provide antigen stability and immunogenicity similar to that of conventional vaccines with improved safety. The icosahedral symmetry of plant viral capsid based nanoparticles is highly ordered and their multivalent structured protein nanostructures facilitate genetic modifications that result in the display of heterologous epitopes or antigens attached to coat proteins. 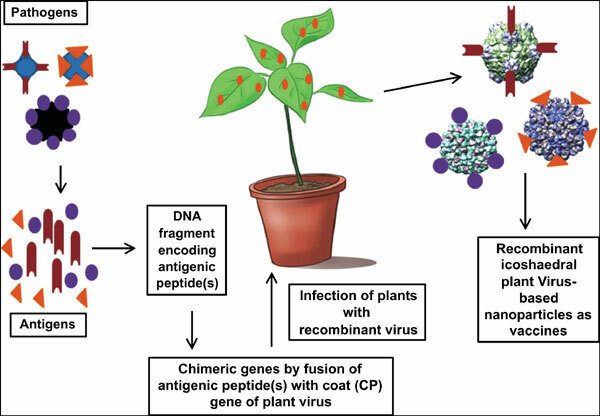 These recombinant plant virus-based nanoparticles (PVNs) provide platforms for the induction of humoral and cellular immune responses to genetically fused antigens from pathogenic viruses, bacteria, tumors, and toxins in man and animals. Here, we comprehensively review the developments of several recombinant PVNs as prophylactic and/or therapeutic vaccines for the prevention or treatment of several microbial diseases, pathologies, and toxin poisoning.